Come join us during our Pee Wee Tennis Clinic at 38350 Alta Drive, Fremont, CA 94536 where we will let your little one have fun and learn tennis basics at the same time with our Pee Wee Tennis sessions. 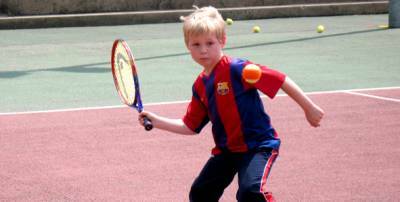 Our program offers your small tennis star a fun introduction to the game in a setting that’s perfect for their learning abilities. With instructors who continually provide that extra effort that is so necessary to teach little ones the fundamentals of the game, here you’ll find a program that will keep your child motivated and interested while truly enjoying an introduction to tennis. One clinic per week is $95/month (four meetings a month). The Euro Member rate is $80/month. Visit our website today and sign up for one of our clinics!